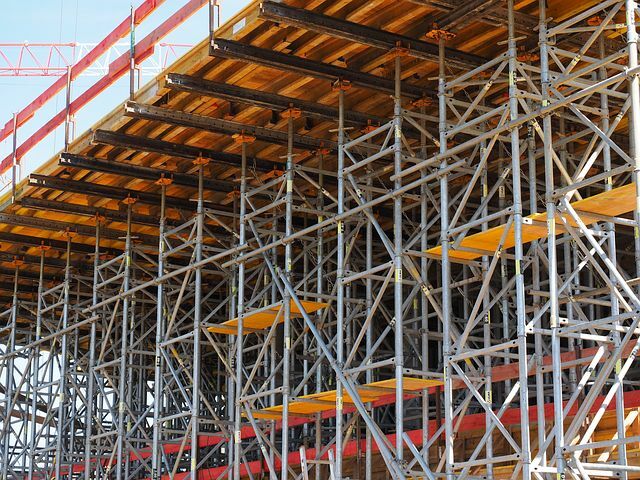 Scaffoldings are all about the development of temporary structures to aid in construction or in the maintenance of existing buildings, with the focus being on safety and harm minimization for workers in these environments. As such, there are a myriad of issues that can come up. With a duty of care to workers, it’s extremely important for employers in these jobs to analyse the safety conditions and manage them accordingly. Naturally, as scaffoldings tend to support work above (or way above!) the ground, there is the risk of falling. This is the most common hazard on the job. A risk assessment must be conducted to determine if there is a high risk of falling 2 metres or more. If this is the case, physical preventions like guardrails must be put in place. 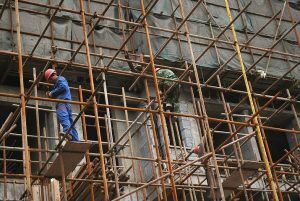 Tools and debris can too fall and hit workers, making this another common scaffoldings-related harm. And the impact of such weighty objects giving in to the force of gravity can lead to some very serious injuries, including a fatal head fracture. Guardrails and head gear are just a couple of the things that can be put in place by employers to protect workers from this hazard, and prevent loose items from falling. Scaffoldings-related injuries can also come from unstable planks. When these aren’t fitted securely, the are prone to slipping off, which can cause workers to fall. They can also break if they unable to support a weight, and tipping when a worker stands in the overhanging position. To help control for these issues, proper grades of lumber must be used, and planks inspected with high attention to detail. As electrical lines tend to be in the areas where scaffoldings are erected, and sometimes come into contact with the structures, electrocution is a risk. It’s important to ensure workers will always have adequate clearance from power lines. If a power line comes in contact with wire reinforcers, for example, it can cause electricity to run through the entire metal frame. If not put together correctly, scaffoldings can fall apart, which is a very dangerous situation. In addition to checking the framework has been constructed with precision, it’s essential to inspect for defective parts – even if the framework is perfectly constructed, this can still lead to hazards. Another major risk comes when the temporary structure is overloaded – more weight placed on it than what can be supported. This creates excess strain on the structure which can lead to collapses. Workers are bound to be put at risk if not provided with secure and appropriate personal protective equipment. Harnesses nor handrails, for instance, must not be loose. Certified head protection gear should be provided to all workers as a precaution for falling items. These all have specialized safety-oriented features targeting the risks at hand. Risk of injury grows higher with poor weather conditions such as rain and winds. 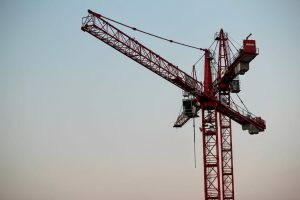 The most important thing for employers to do is assess ahead of time whether conditions are unsafe, and not make workers be on site if this is the case. Scaffoldings must be taken apart in the reverse order to which it is constructed. All parts need to be lowered carefully and never dropped. The latter would be very dangerous to workers. What effect does serotonin have on the brain?